Invalid working "path/folder" (sometimes, an invalid network connection may appear with this warning too) . Abnormal errors such as "internal errors" (bad data stream), invalid command, or logic issues. If you close your laptop or turn off your computer while the recording is converting, it will stop the conversion process. If you change the name of the double_click_to_convert.zoom file(s) while the recorded meeting is converting, it may corrupt the file and not convert correctly. 1. Please check your "Disk space" and try and free up some space if it is low. 2. 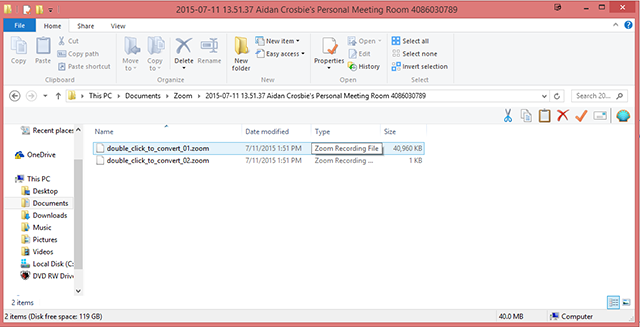 Change the recording location in your Zoom client and make sure it is a valid path string/folder. 3. After completing Steps 1-2, you may then try to manually convert your meeting by selecting convert for the recording that has not yet converted. To do so, select Meetings>>Recorded>>Convert. If the click to convert fails, please send us the file for a manual conversion. Note: Conversion times vary based on file size as larger files need more time due to download/upload wait times. In most cases, you can expect a 24 hour turnaround. Find the Double_Click_to_convert files by selecting Open under the meeting that failed to convert. Upload both of the "Double-click-to-convert" files to something like - Dropbox, Box, Google drive, etc. Send the URL/shared link to us via a support ticket and we will manually convert your recording, upload the successfully converted file and send it back to you.